Magnificiant 7 Jazz Band, a band formed in 2013 consists of musicians of the bands of Chris Barber, Kenny Ball and Mr. Acker Bilk. 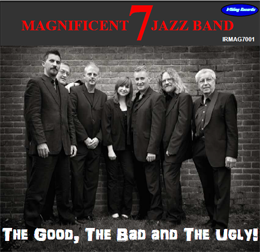 To name a jazz band the Magnificent 7 may appear on the face of it, rather ostentatious. However, in this case the title aptly describes this outstanding collective. Co-led by internationally acclaimed Richard Exall and award winning Amy Roberts, the personnel are all recent or current alumni of the three great British revivalist bands of the 1950's. This debut recording acknowledges the works of Chris Barber, Acker Bilk and Kenny Ball, recreating the hits that defined the genre. The bands' repertoire is as exciting as it is eclectic, weaving a carefully tailored course through the world of improvised music. Paying homage to the early pioneers Oliver, Armstrong and Ellington, plus a little latin for added colour. The Magnificent Seven Jazz Band works as a team, with sparkling contributions from all the musicians, which ensures an amazingly powerful sound with a broad commercial appeal. Quite simply The Magnificent 7 Jazz Band truly are magnificent!